Pythagoras was born on the Greek island of Samos, site of a "monumental" temple to Hera, queen of the Olympian gods. His mother Pythias was a native of the island and his father was granted citizenship for giving grain to islanders during a drought. His birth was predicted by the oracle at Delphi, and Pythagoras was considered a semi-diety, the son of Apollo by a virgin birth. He spoke in parables called akousmata, the basis of many biblical parables, and was said to have worked miracles, conversed with daemons and heard the music of the stars. Pythagoras most likely traveled to Egypt with the intention of learning the sacred rights and secrets of the region's religious sects. He was eventually accepted at Diospolis, where he studied for at least a decade. In 525 BC the Persians invaded Egypt and Pythagoras was taken captive to Babylon. According to his Roman biographer Porphyry, Pythagoras studied under the sage Zaractas, from whom he learned astrology and the use of drugs for purifying the mind and body. He was also initiated into Zoroastrianism and his famous Phythagorian theorum probably had a Babylonian origin. Pythagoras returned to Samos and tried to teach, but soon left forever and founded a religious community in Croton, Italy. He and his followers never cut their hair or beards and were forbidden to wear leather or wool. 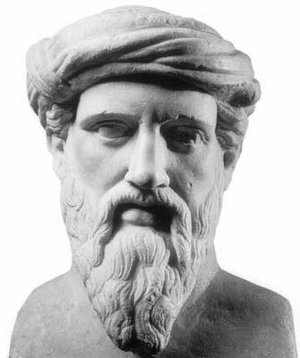 Pythagoras believed the mystery of the universe revealed itself in numbers, to which he ascribed qualities like maleness (odd numbers) and femaleness (even numbers). He discovered that strings in a 2:1 ratio vibrate an octave apart, while those in a 3:2 ratio produce a musical fifth, etc. In Pythagoras's cosmology, the solar system revolved around a "central fire." In the third century B.C., the Pythagorean astronomer Aristarchus put the earth and planets revolving around the sun, 1800 years earlier than Copernicus. But while Plato embraced Phythagorian concepts, Aristotle rejected mathematics as the means of explaining the true nature of the world and modern physicists have charged him with holding back physics for 2000 years. When Christianity began to take hold in the third century, some prominent Christians like Tertullian opposed all "pagan" ideas, while others like Augustine valued Greek learning and became Neoplatonists. Ultimately, the mantle of the Greeks passed into the Islamic world, where scholars kept it alive until the Western universities rediscovered it between the 10th and 12th centuries. The Renaissance artists and architects were greatly influenced by Pythagorean mathematical ideas. Leonardo urged, "Oh, students, study math and do not build without a foundation." Another Neoplatonist was physicist Johannes Kepler (1571-1630), who first deduced that planets have elliptical, not circular, orbits and that the sun possessed a power later called gravity. Kepler said, "Why waste words? Geometry...is God himself." Fitz Hugh Ludlow's 1857 book The Hasheesh Eater, which popularized the taking of hashish in the United States, was subtitled, being passages from the Life of a Pythagorean.